Purple Onion Designs: It's a beautiful day! Hello, friends! Today I have for you a card I made with rubber stamps from Purple Onion Designs. 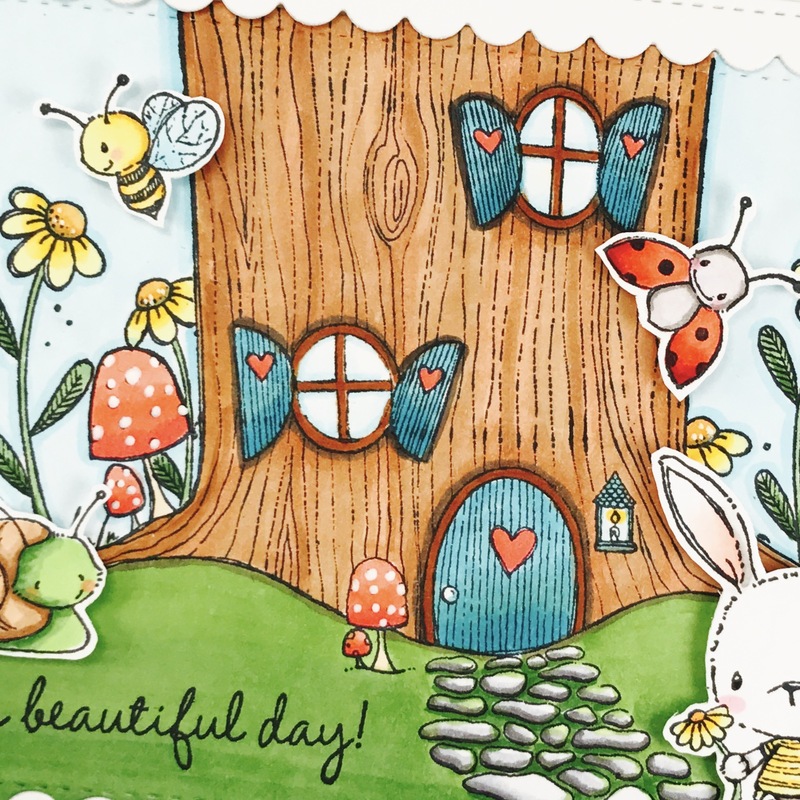 I created a spring/summer scene using the Treehouse, Bloom no 2 (daisies), Garden Bugs and Chloe (bunny with flower). The Treehouse stamp is originally intended for a winter scene because some of the areas are covered with snow. So I prepared the stamp by covering just the snow areas with sticky post-its. Then, I applied black Momento ink and removed the post-its before stamping it on trimmed smooth white cardstock. I added any missing lines with the Copic liners. At this point I wanted to add Bloom no 2 (daisies) behind the trees so I masked the sides of the tree including the mushrooms with prepared masking paper and stamped the flowers. I colored the entire background with Copic markers. Before moving on, I stamped one of the sentiment from Sweet Summer Sentiment set. 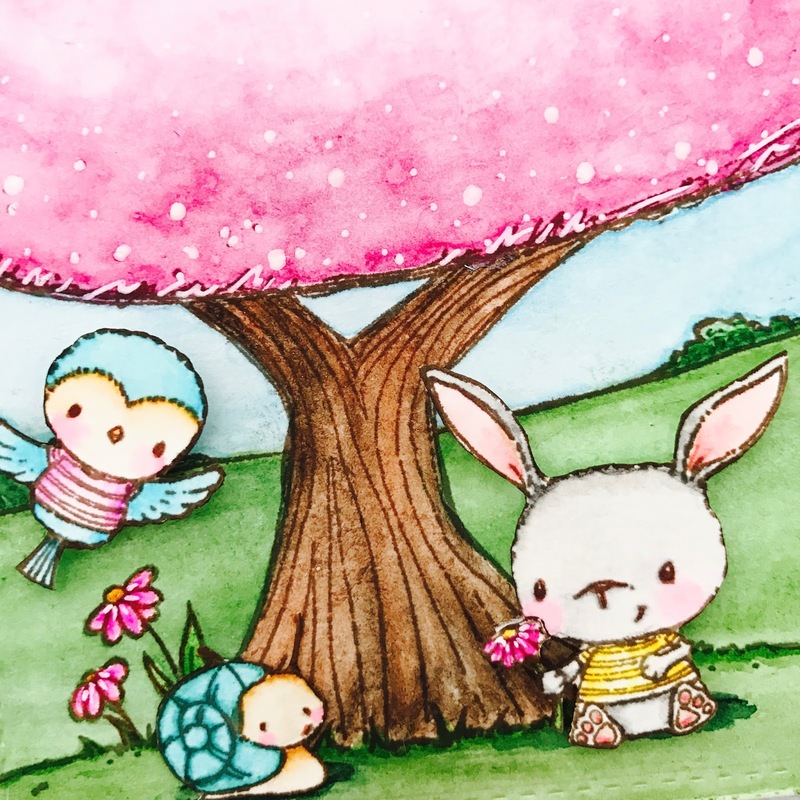 I stamped Chloe and Garden Bugs (they are just the cutest) on smooth white cardstock and colored them in with Copic markers and cut them out. I added dimensional adhesive behind and adhered them to the front panal. I also die-cut a white cardstock using the larger frame from Pretty Pink Posh Scallop Frames and added dimensional adhesive and adhered that to the front as well. This added nice dimension and interest to the card. Thanks for stopping by and I wish you a beautiful day! Hello friends! 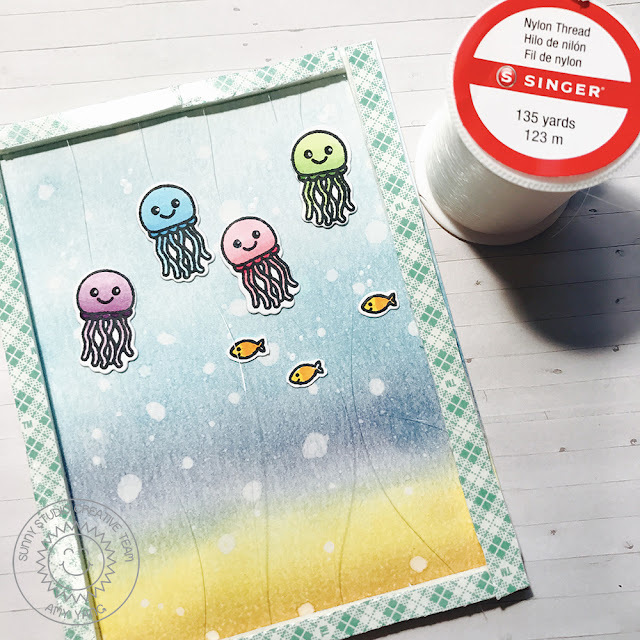 I'm here to share with you a fun suspended shaker card using the lovable Magical Mermaid stamp set from Sunny Studio Stamps. I stamped the images, colored them with Copic markers and cut them out using the coordinating dies. 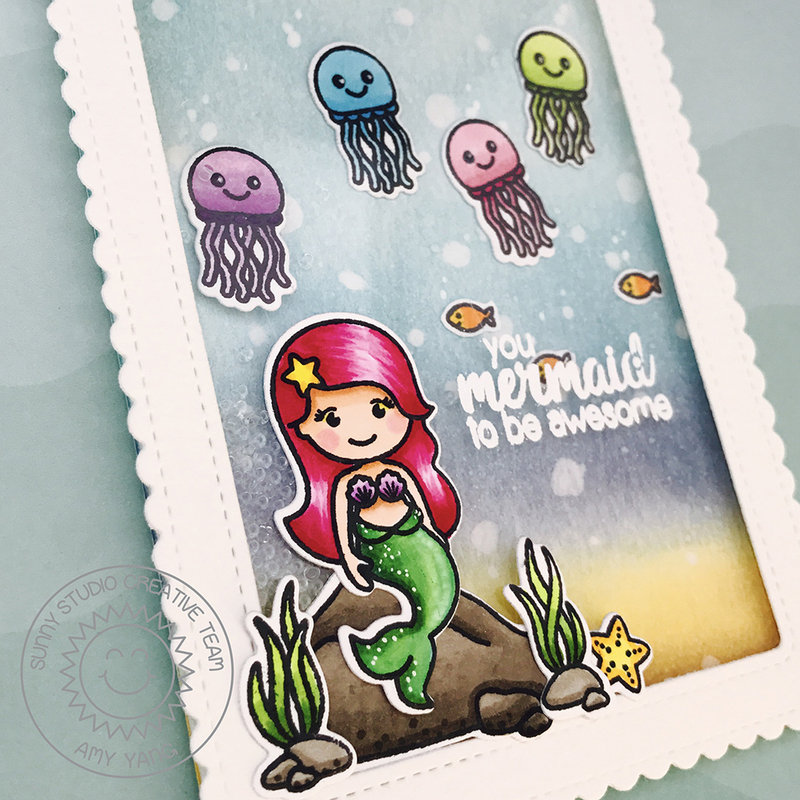 I then stamped and heat embossed the sentiment "you Mermaid to be awesome" on heat resistant acetate and adhered it to a frame. This served as the window for the shaker card. I distressed the background with Distress inks and added splatters of water on trimmed watercolor cardstock. Here comes the fun part. I suspended the jellyfish so that they don't turn upside down when the card is shaken but still move around in a controlled motion. I did this by taping clear thread behind the adorable jellyfish, and loosely sandwiching the thread on the top and the bottom of the foam adhesive (shown below). After adding the fish and some clear sparkly beads from Pretty Pink Posh , I adhered the shaker window to the distressed panel. I'm glad I went with the clear beads because when the card is shaken it reminds me of bubbles and currents in the ocean. I also had fun to watching the jellyfish bobbing around. 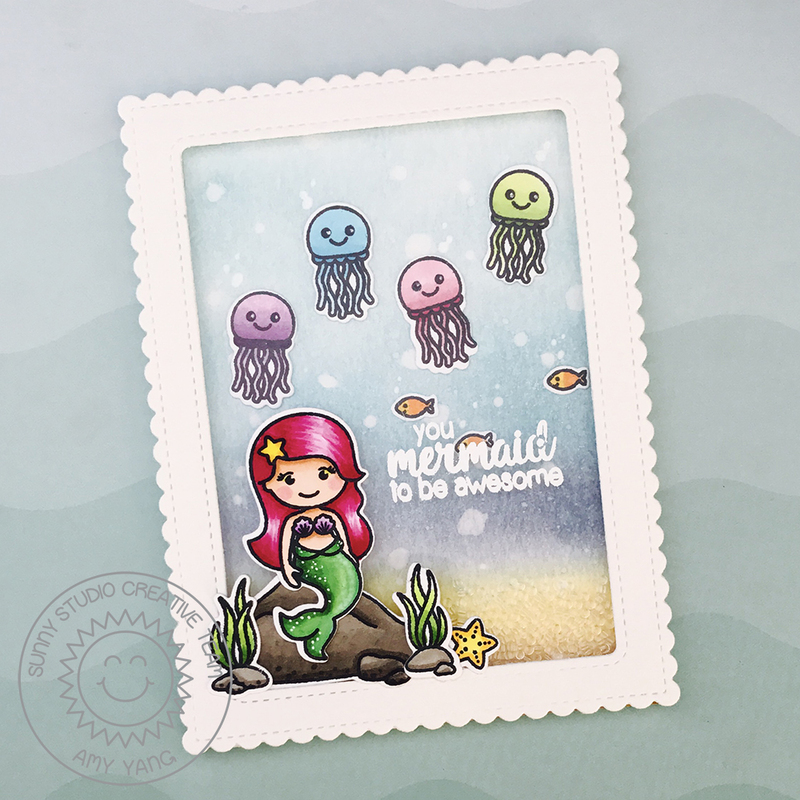 To finish, I added the mermaid (she's so sweet, I just love her) and the rest of the images to the front of the card. 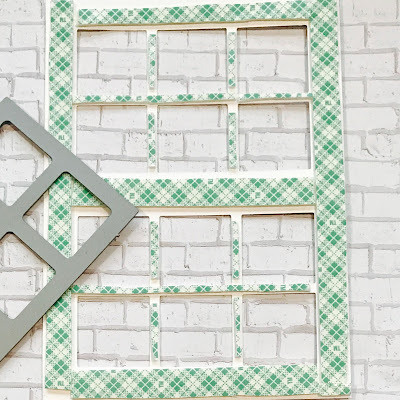 The idea of the suspended stamped images was inspired by a video Jennifer Mcguire shared on Instagram, to read more about it on her blog click here. I hope you like today's card. Thank you for stopping by! Hello, friends! 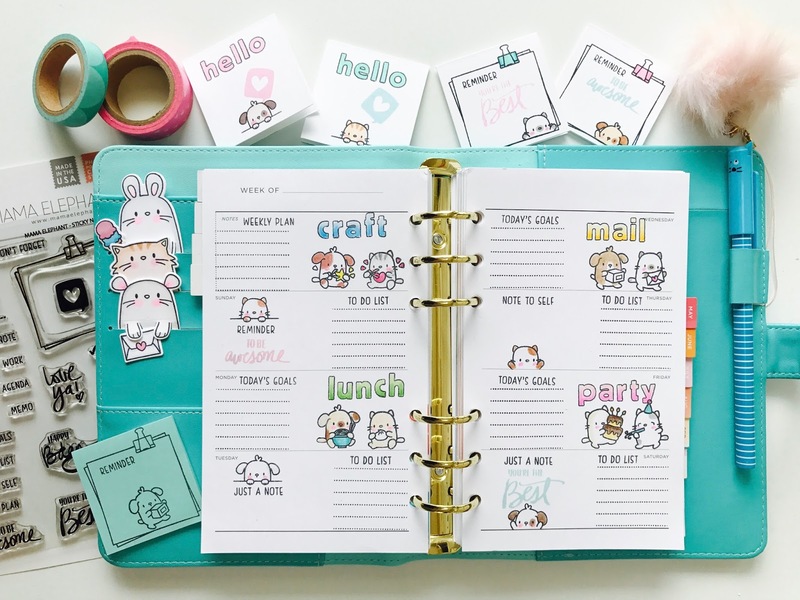 Today Mama Elephant is showcasing the adorable Little Dog Agenda set. I love small and cute things, and this definitely fits the bill. This set is great for planners, tags and even cards! To begin, I die-cut Copic friendly paper using rectangle die from Peek a frame creative cuts. It adds a nice stitched detailing around the borders. Then, I stamped part of a sentiment from Wishing You on black cardstock using Versamark ink, and heat embossed it with white embossing powder. After, I stamped the main sentiment from Tandem Extras using black ink on the front of the die-cut paper. I attached the sentiment on the black cardstock with dimensional foam. Next, I randomly stamped all the little dog images, trying to space them out as evenly as I could. I then colored them with Copic markers. I also stamped the little dog holding a heart separately and propped him up with dimensional foam. This card was almost too easy and so fun to make, I made a second card with the same stamp set. For the next card, I distressed the sides of an A2 size Bristol cardstock with a variety of Distress Oxide inks. Then, I die cut white cardstock using a 6 window frame from Peek a Frame creative cuts as shown. I added a layer of foam adhesive around it and attached it to the distressed panel. Next, I took the negative squares, inked them with Distress Oxide ink and placed them back into the frame. 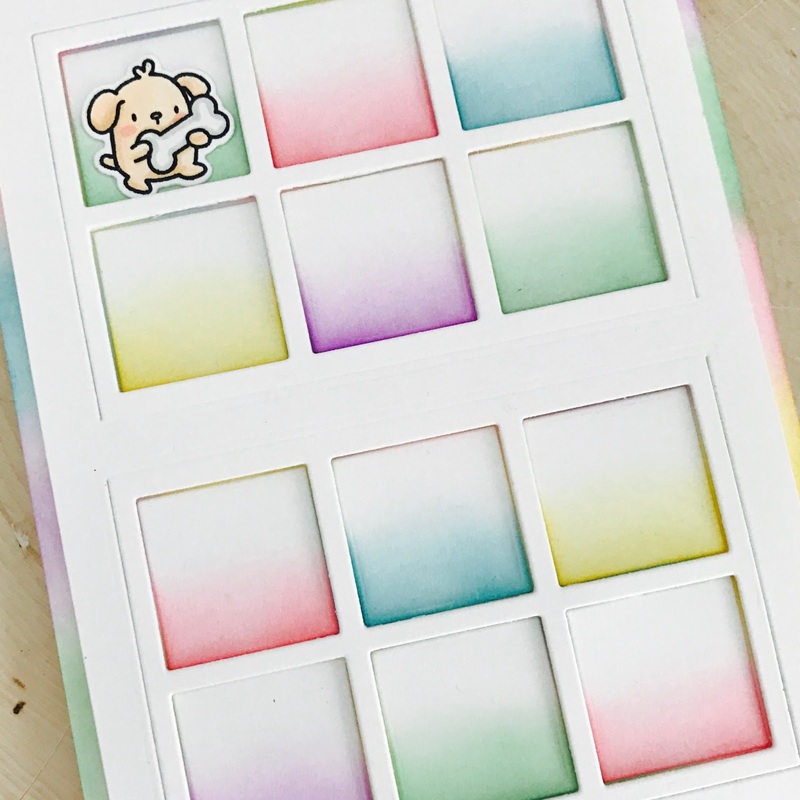 I stamped and colored the little dogs with Copic markers, and cut them out with their coordinating dies. After, I placed them inside the squares. For the sentiment, I stamped Hollow Letters and colored them in with Copic markers, trying to match the colors of the Distress Oxide inks. I was really going for a colorful card, as you can see. To finish the card, I fussy cut them out and adhered them to the front as shown. I hope you enjoyed both cards! 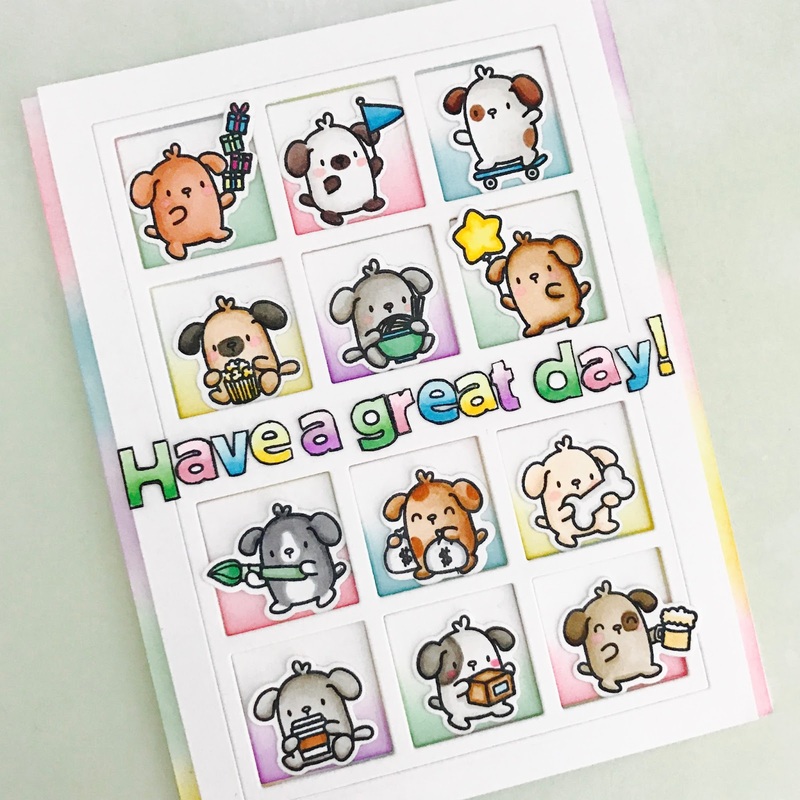 You can visit the Mama Elephant blog to see more projects featuring the Little Dog Agenda stamps by the super talented design team. Hello there! I hope you're enjoying your weekend. Before I head out to church today, I wanted to share a card I made using wonderful rubber stamps by Purple Onion Designs. 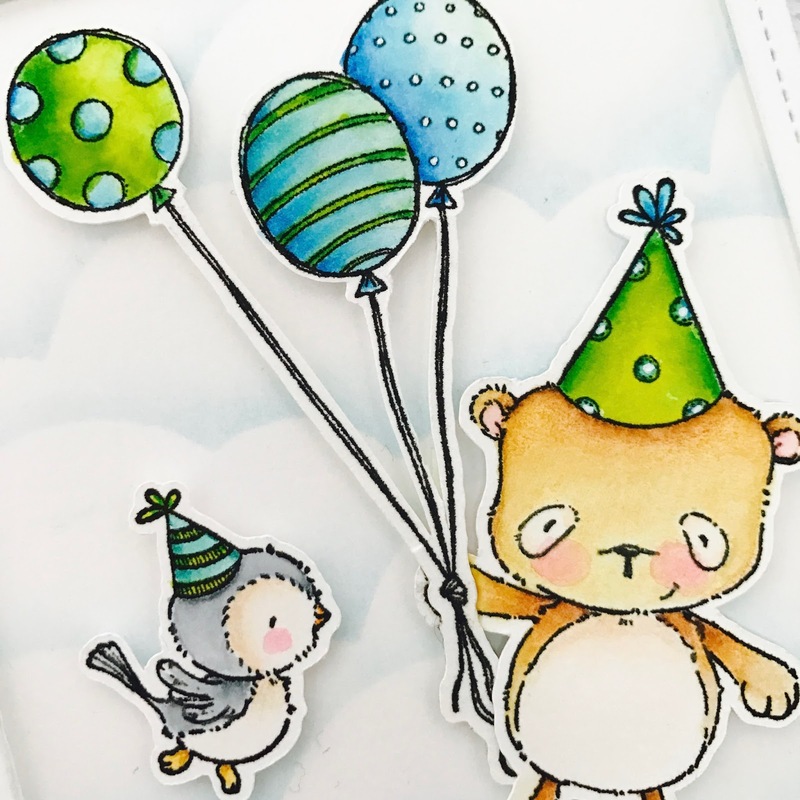 I used the adorable Happy (party bear), Sunny (flying bird with party hat) and Balloon Trio Streamer stamps to make a birthday card. I stamped the images with black Versafine ink on bristol cardstock and colored them with Zig clean color real markers. 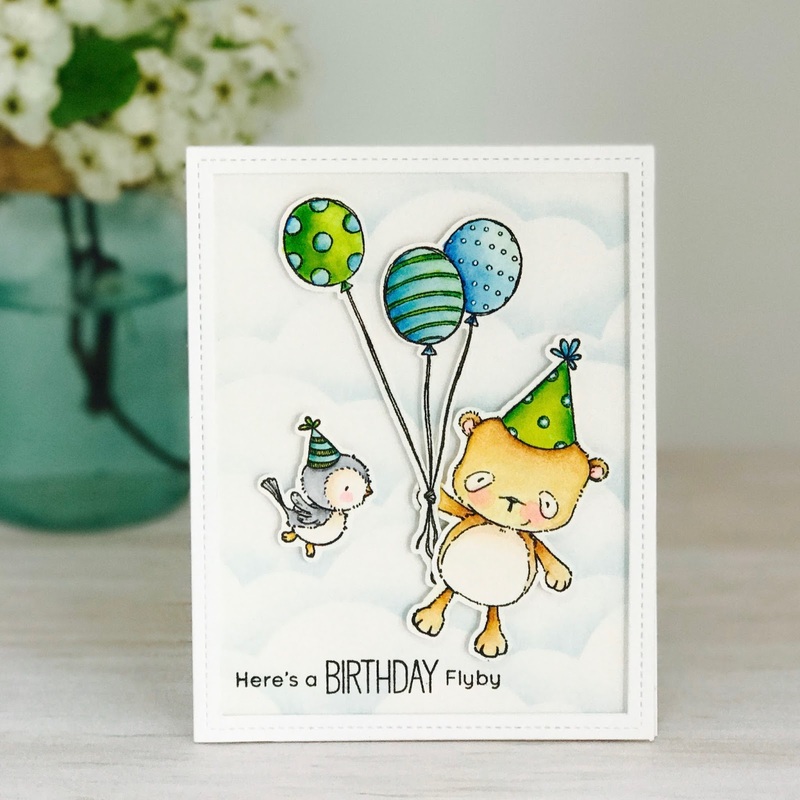 I chose shades of blues and greens to color the balloons and party hats because I wanted to make a masculine card. Then, I created the background by adding puffy clouds using Distress Ink in Tumbled Glass with a acetate I die-cut using a cloud border. I thought it'd be fun to have the bear and bird flying in the clouds with the balloons. Luckily, I was able to find a perfect sentiment to go with it from MFT stamps. To add dimension to the card, I die-cut a frame from Lawnfawn and added foam adhesive behind it. After, I attached it to the background panel. To finish, I also added foam behind the images and adhered that to the panel as well. Thank you for stopping by. Have a blessed and happy Sunday!!! Hello, friends! 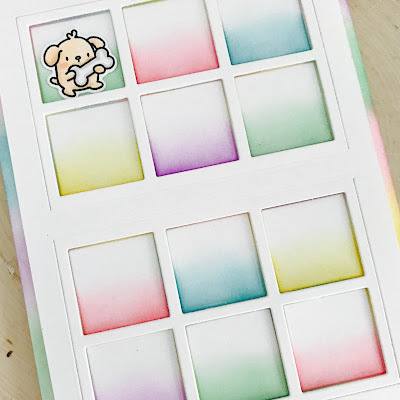 I'm back again with Mama Elephant to highlight the super cute Sticky Notes set from their new release. 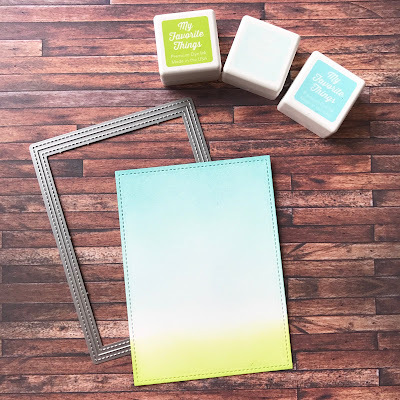 This stamp set is great for planners, scrapbooks and little note-cards. I created a weekly planner spread and a few note cards to share with you today. 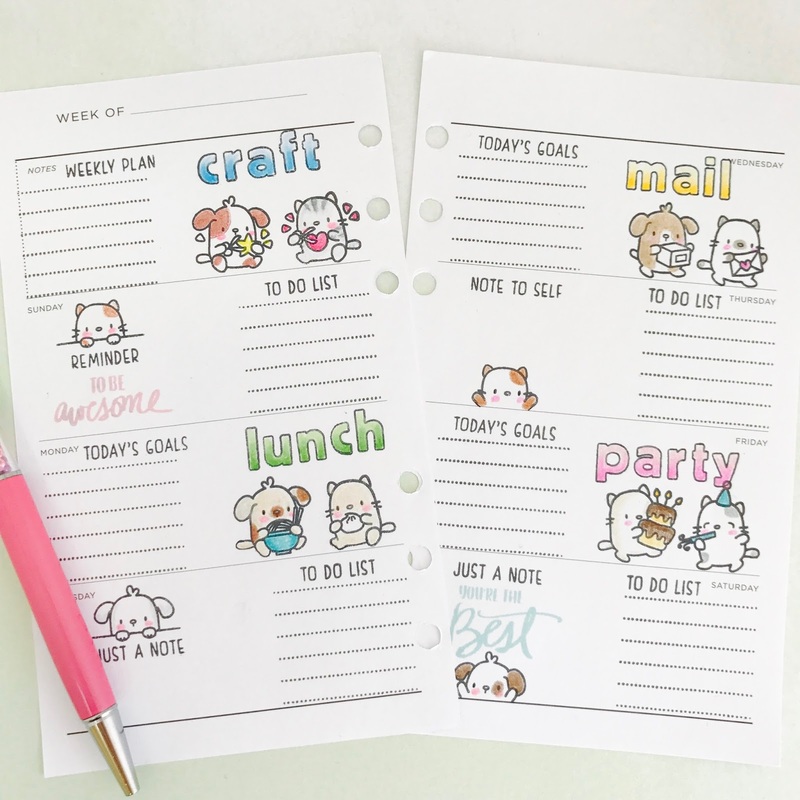 For my planner spread I used Sticky Notes, Little Dog Agenda and Little Cat Agenda stamps. They go perfectly together. I also used Hollow Letters to stamp words onto my planners and note-cards. I loved that I was able to color them in and make the words pop. I colored all the images with Prismacolor pencils. On the side of the planner, I have the Page Huggers animals that was stamped, colored with Copics and die-cut with the coordinating dies. What's great about these coordinating dies are that they will cut the image and it will cut right under the paws of each animal creating a little flap. This allows you to use them as bookmarks for books or planners or a fun card where you can just stack them on top of each other. I also created these little note cards. I colored the images with Copic markers. I think they are great for sending notes with words of encouragement to my kids in their lunch boxes or backpacks. 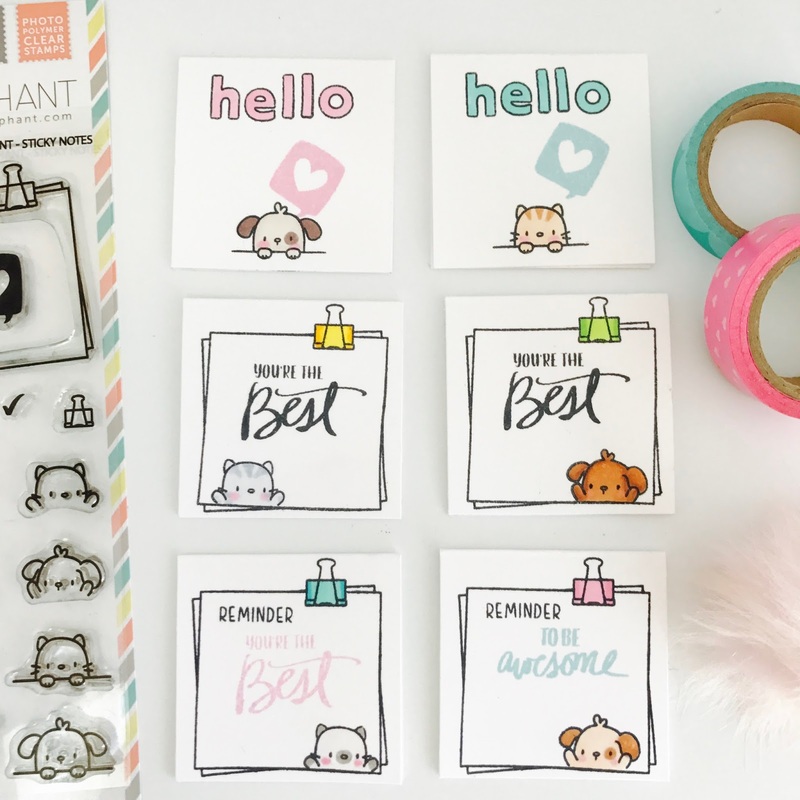 Make sure to stop by the Mama Elephant blog to see more projects featuring the Sticky Notes sets by the talented design team. Hello friends! 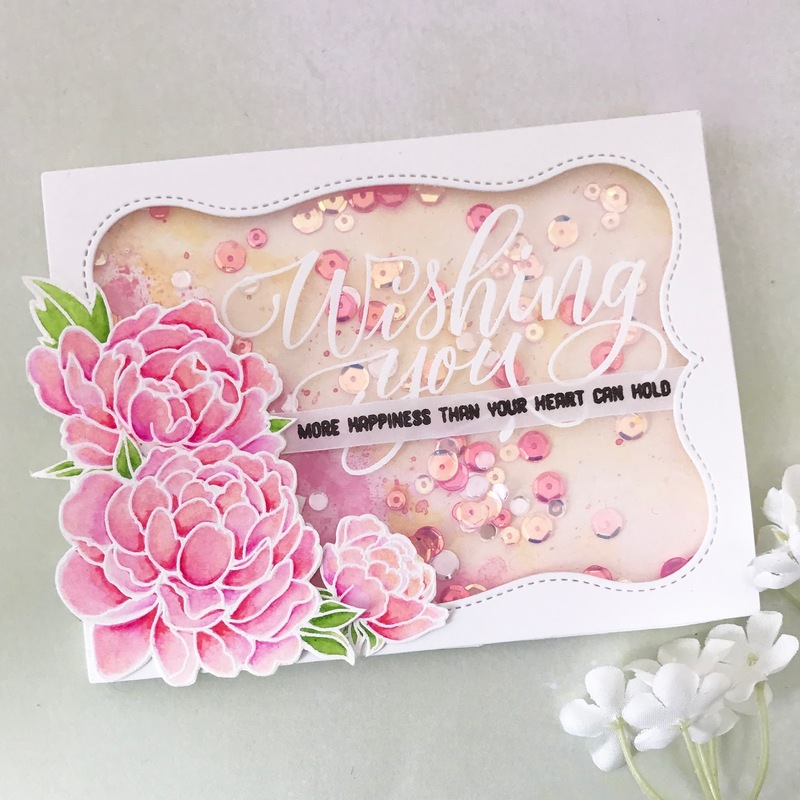 I'm here today to share with you two cards I made using wonderful products from Pretty Pink Posh. I'm featuring a die set called Stitched Stars. In this set, you get four star shapes of varying sizes. They are awesome for creating shaker windows for shaker cards because of their duel stitching. For the first card, I stamped and colored the bear from the Halloween Friends set with Copics and cut him out with a coordinating die. I then die-cut prepared white cardstock using the biggest star from the Stitched Stars set. I used the negative cut to create my shaker window. 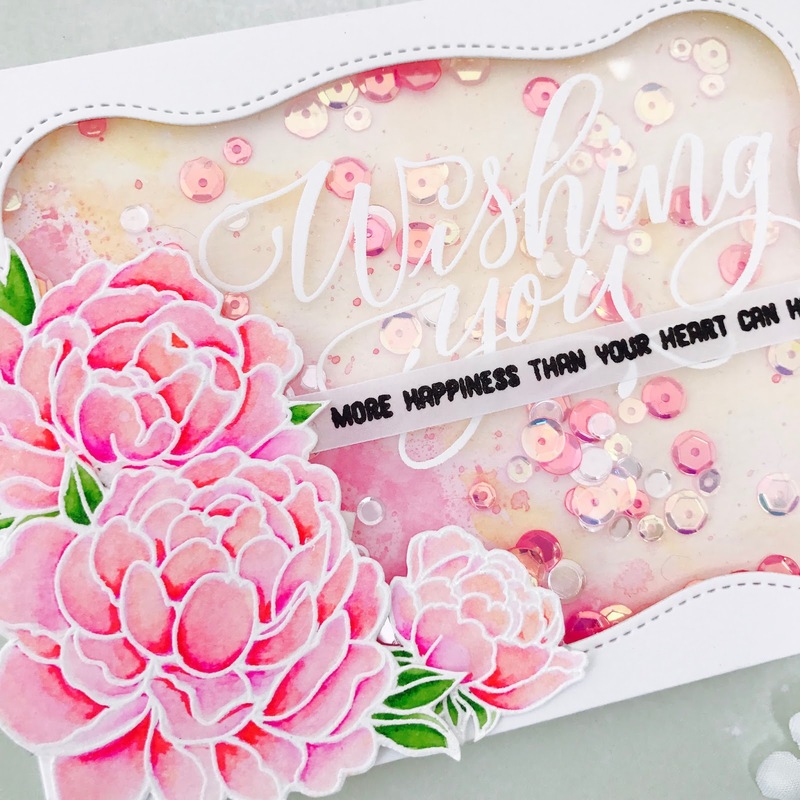 I trimmed heat resistant acetate and stamped the sentiment "Celebrate it's your big day" from Everyday Greetings with Versamark ink and heat set it with white embossing powder. I adhered the acetate to the back of the front panel. To create the background, I lightly distressed the prepared cardstock with Distress ink in Mustard Seed. I also die-cut a bunch of stars using the two smallest stars and distressed them as well using the same ink. Before adhering the shaker window, I added a thin strip of dimensional adhesive on the acetate with the backing removed (this allows you to bend the foam) around the large star (to keep the sequins inside the enclosed area). I also added dimensional adhesive around the outer edges of the background panel. Before adhering the two panels together, I added 4mm Sunshine Glow sequins. To finish, I cut between the bears wing and around the bear's arms so that he could hold the star. Then, I adhered the bear and the stars to the front panel. I placed the bear on a slant so that he looks like he's flying. I mean, he does have wings...right? The next card is made the same way as the first card, but I kept the background white and added Spring Seed Beads instead. I stamped the sentiment from the Friends Forever set. After, I added the bunny from the Holiday Pals. I love this bunny; using this image adds a lot of cuteness and sweetness to the card (in my opinion, anyways). If you're not a critter stamp lover like me, you can omit them from both cards and I think it'll look just as nice. For both cards, I kept the front panel white for a cleaner look, and to bring more attention to the stitched stars as well as the beads and sequins. Thanks so much for looking! Have an amazing day!!! Happy Wednesday friends! 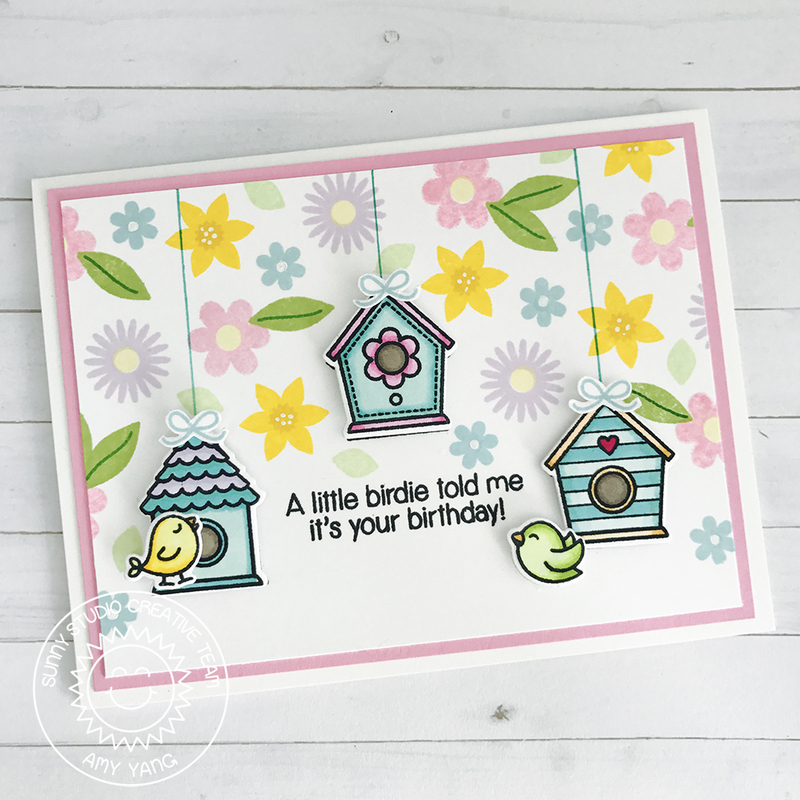 I'm sharing a card that features the new stamp set, A Bird's Life and last month's release, Friends & Family from Sunny Studio Stamps. I thought these two paired very nicely together to create a flower background, setting the stage for the birdhouses. To create the front panel, I trimmed smooth white cardstock to 5"x 3.75". Using a Misti Tool, I placed the birdhouses and the sentiment where I wanted them to go and stamped it using black ink. To create a flower background, I stamped a variety of the bold flowers and leaves with pastel dye inks. I stamped them around the birdhouses, spacing them as evenly as I could. I did this using the stamps in the order of largest to smallest. This allows the smaller stamps to fill in the open areas. 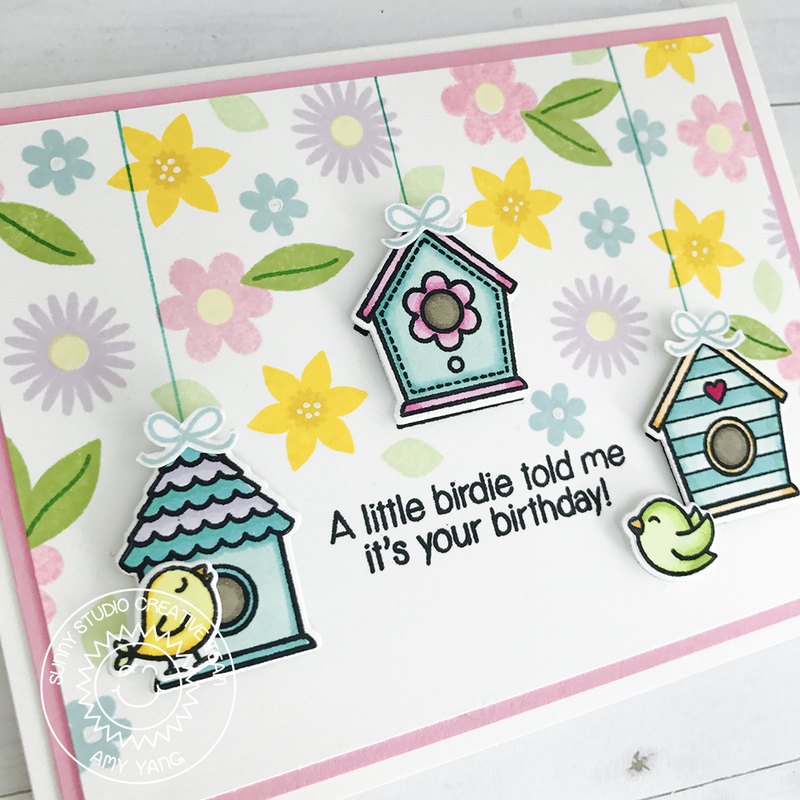 I wanted this card to have some dimension so I stamped the birdhouses and the cute little birds on the smooth white cardstock and colored them with Copic markers. I also stamped the bows and die-cut all of them using the Coordinating Snippets. Then, I went back to the front panel and drew a line with a green Gelly Pen from the top of the card to the roof of the birdhouses. To finish my card, I added foam adhesives behind all the images and adhered them to the front. Isn't this card tweet? I hope you like it! Thank you so much for stopping by today, and I hope you have an awesome day! Hi there! 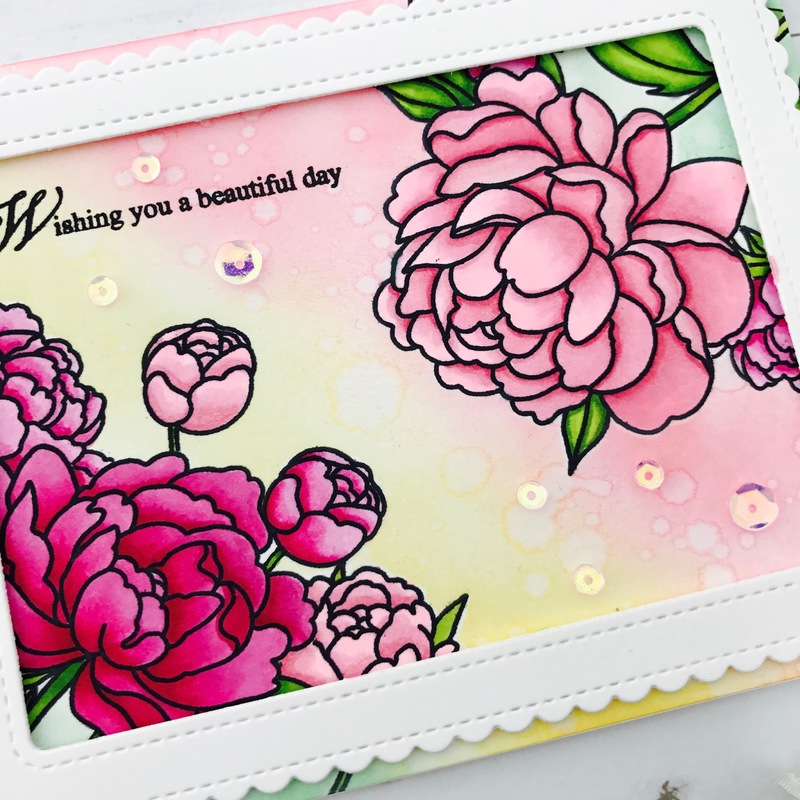 Today, Mama Elephant's Design team and I are showcasing the Pretty Peonies stamp set. I colored the stamped images with Copic markers, distressed the background and framed it with a border I die-cut from Madison Avenue creative cuts. I started the card by stamping the floral images on full adhesive Post-Its. I cut them out and then stamped the peonies using black ink on A2 size copic friendly paper. I used the masking technique to add layers to the peonies as shown. Then, I adhered the masking paper back onto the flowers in order to distress the background. To do this, I used Distress Oxide inks and added some water splatter marks. Afterwards, I stamped the sentiment that is included in the stamp set. I colored the flowers with Copic markers. The two colors I chose for the peonies are inspired by the ones that grow in my garden every summer. I decided to frame the card to add interest and dimension. So, I die-cut a white cardstock using Madison Avenue creative cuts and used dimensional adhesive to attach it to the front panel. To finish, I added some sequins from Pretty Pink Posh. I hope you like today's card! Make sure to check out Mama Elephant blog to see more projects featuring Pretty Peonies set. Hello crafty friends! 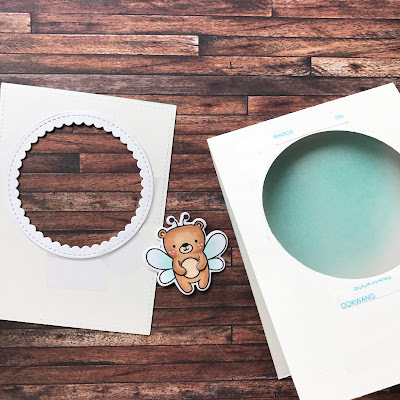 Today I'm joining Mama Elephant to highlight the new Wishing You set. One of the things I love to do is create scenes by mixing stamps. So, I used the stamps from Rowdy Raccoons, Party Animals and Up and Away to make a birthday card with the sentiment from Wishing You. For the front panel, I used my favorite A2 sized stitched rectangle die from Peek a Frame Creative Cuts to die cut Bristol cardstock. Then, I inked the background using Distress inks in Peacock Feathers and Twisted Citron. I stamped the beautifully hand lettered "Wishing You" sentiment using black Versafine ink. I stamped the smaller sentiment onto black cardstock using Versamark ink. Afterwards, I heat set it with white embossing powder. Then, I popped it up with dimensional adhesive. For the images, I decided to use a masking technique. Just in case you're not familiar with it, masking is a technique of covering a stamped image, so that other stamped images may be placed over it. Here, I stamped the raccoon on the tricycle from Rowdy Raccoons on smooth white cardstock and stamped it again on a fully adhesive Post-it. I trimmed out just his head. 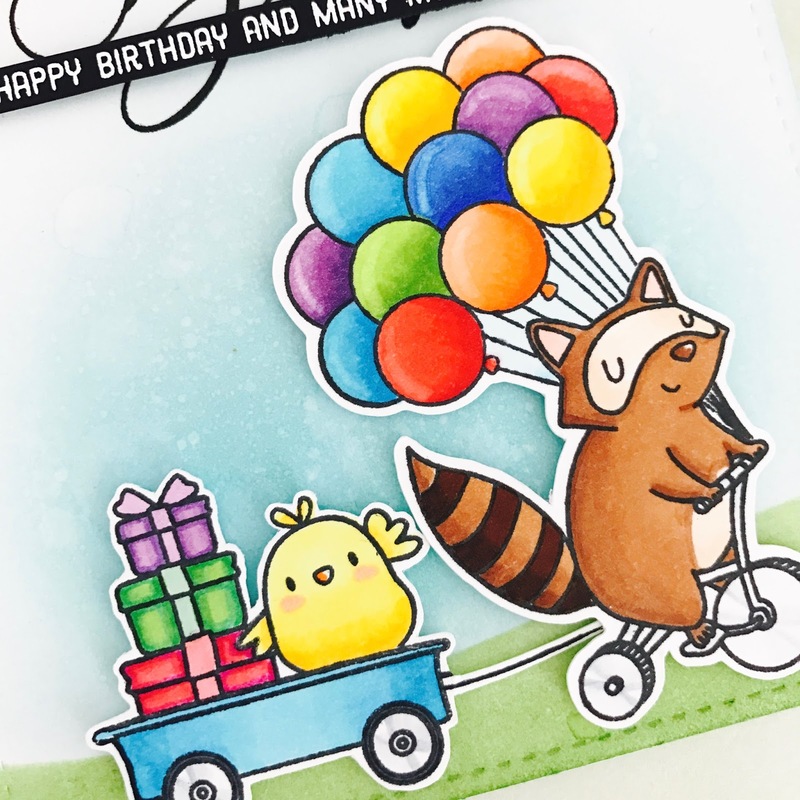 I adhered the raccoon's head to the cardstock with the raccoon, and I stamped the balloons from Up and Away on top. When you pull off the post it, you'll get an image where the balloons are behind the raccoon. Pretty cool, right? For the wagon (the image has a handle on the left), I inked the image and before stamping I wiped off the ink on the handle. I didn't want the handle because it was facing the wrong way. After stamping it, I filled in the missing lines with my copic liner and also drew a string to attach to the tricycle. After, I masked the wagon and stamped the bird. I wanted the bird in the front, so I masked the bird as well and stamped the presents. The cute bird, presents and cake are from the Party Animals stamp set. I colored the images with Copics and cut them out. I then adhered them with dimensional adhesive to the front panel. 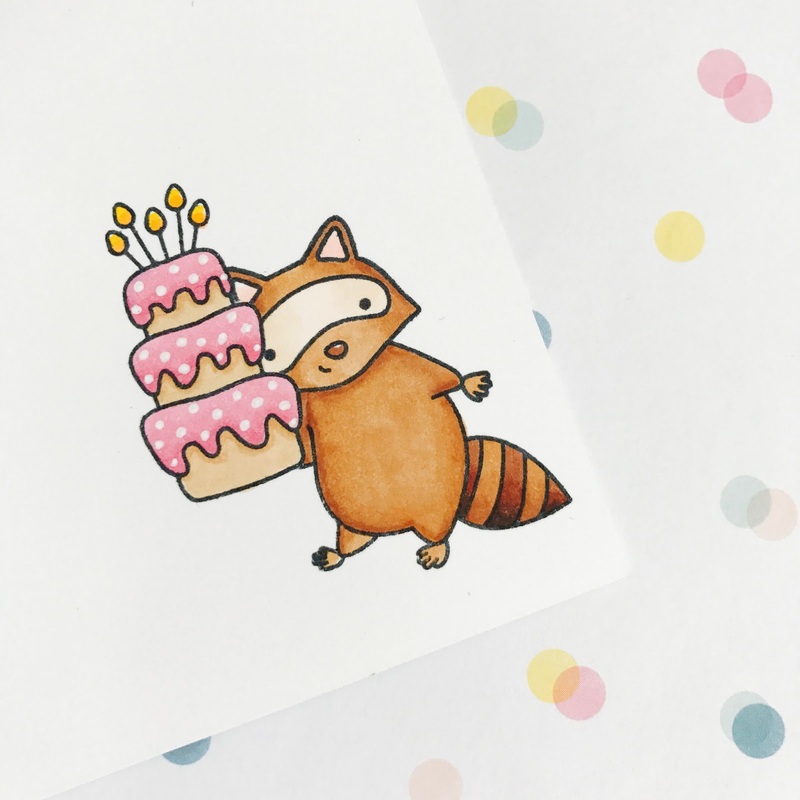 I decided to stamp another raccoon with the cake inside the card. I thought it would be a nice surprise for the recipient of the card. I stamped the cake first and masked it, and then stamped the raccoon to make him look like he's holding the cake. That finishes the card. I really like how this card turned out. 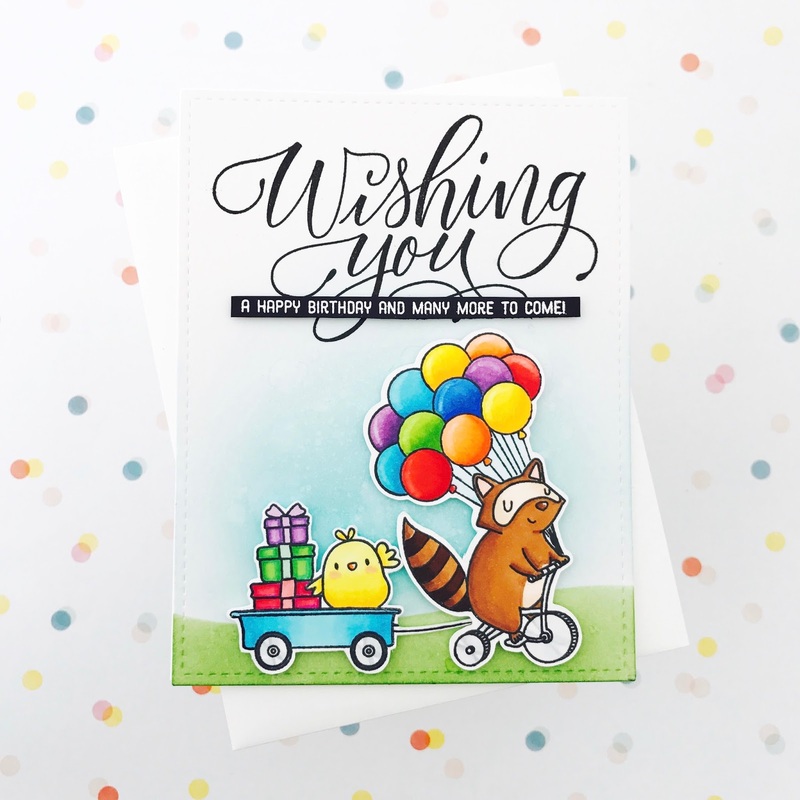 I used stamps from Rowdy Raccoons that wasn't intended for birthday cards, and combined it with other stamps to create a card that goes nicely with the birthday sentiment from the "Wishing You" set. 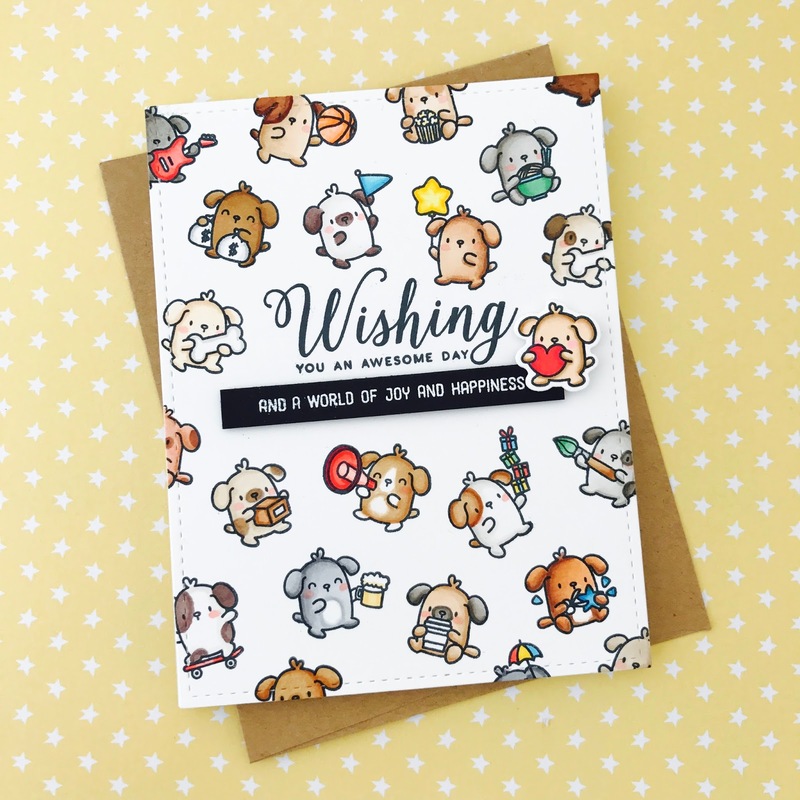 Make sure to check out the Mama Elephant blog to see more projects featuring Wishing You. Happy Easter Day! I hope everyone has been enjoying their Easter week. 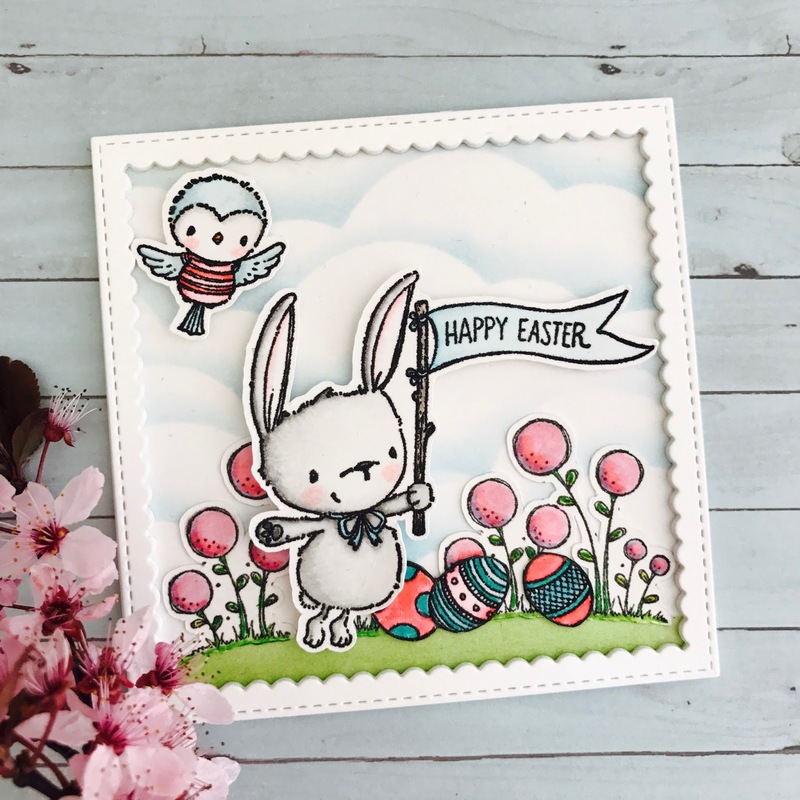 My card today features Ivy (the bunny with the flag), Robin (bird with striped t-shirt), Blooms, and Easter eggs from Purple Onion Designs. I stamped the images on Bristol Cardstock with Versafine Black ink. I colored them with Zig Clean Color Real Brush markers and once it dried, I added a little bit more shading with Prismacolor pencils. For the main panel, I used Bristol paper and added puffy clouds with Tumbled Glass Distress Ink. I colored the ground with green Zig markers. Then, I die-cut white cardstock with a square scalloped frame four times and adhered them together. After, I added the frame to the main panel. To finish, I added dimensional foam behind Ivy and and Robin and adhered all the images to the card to create this sweet little scene. Thank you for stopping by. Have a Blessed Easter! Hello, crafty friends! I'm very excited and happy to announce that I'll be guest designing for Mama Elephant for three months. 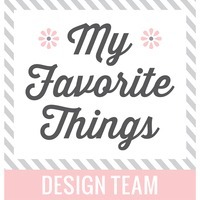 This is definitely a crafty dream come true for me, because I am a huge fan of their fabulous products. Thank you, Kryssi and Angela for this amazing opportunity! For the Stampede, I made a shaker card that features three of the new products you're going to love. I used the Lafayette Creative Cut, Wishing You, and Pretty Peonies stamp sets. I began the card by adding shades of pink and yellow watercolor wash and splatters of watercolors using Kuretake Gansai Tambi on watercolor paper. Once it dried, I trimmed the paper and heat resistant acetate down to 5.5" X 4.25". After I applied anti-static powder to the acetate, I stamped the large sentiment from Wishing You set with Versamark Ink and heat embossed it using white embossing powder. Next, I die-cut white cardstock using the large frame from Lafayette Creative Cut to create my shaker window. I adhered the acetate behind the window and added two layers of dimensional foam around the frame. Then, I adhered that to the watercolored panel after adding some sequins from Pretty Pink Posh's Friendship Sequins Mix. 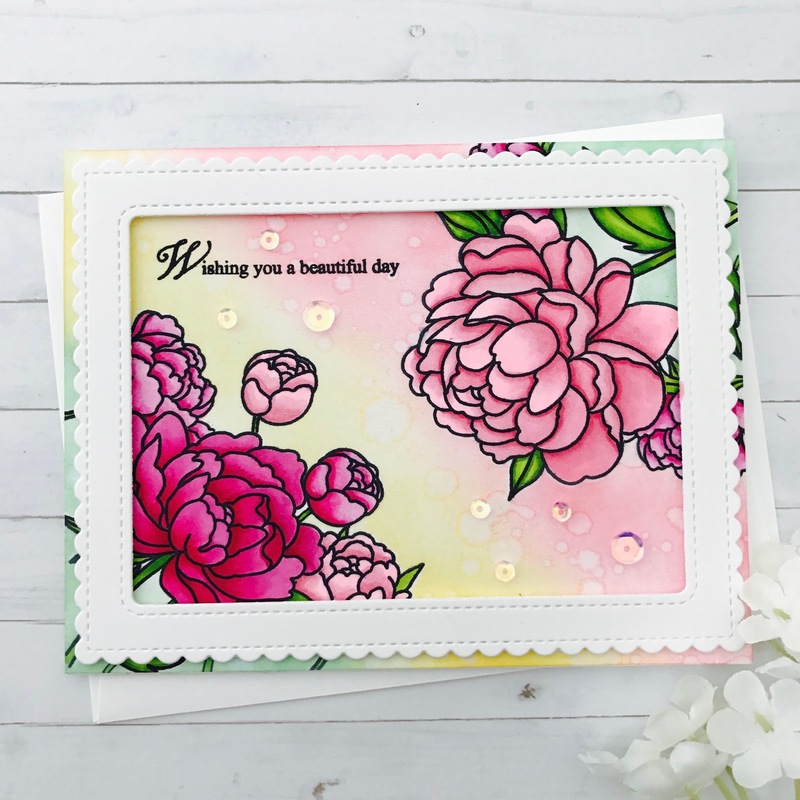 For the flowers, I stamped Pretty Peonies on Bristol paper using Versamark Ink and heat embossed it with white embossing powder. I colored it using Zig Clean Brush Markers and fussy cut them out. Then, I stamped the other part of the sentiment on Vellum paper using Versamark ink and heat embossed it with black embossing powder. To finish the card, I adhered the flowers and the sentiment to the front of the card and attached it to the folded note card. 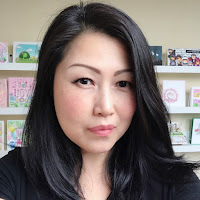 and joining us is our guest designer Amy Yang! Hi there! I'm back with another fun project I made using Pretty Pink Posh stamps and dies. There's this super cute bear from the Halloween Friends stamp set that is dressed as a bee. I thought it would be fun to make him the star of my card and have him spin around. Let's take a look! Making this card wasn't difficult at all, but it did require some extra steps. To begin, I trimmed a white folded note card to 5.25" x 4". Then, I took another white card stock and die-cut it using the rectangle Stitched Notes die. This gave it a nice stitched detailing to the front panel. Next, I added some colors to the front as well as the inside of the card using dye inks with a blending tool. After, I took the the front panel and the card base (I made sure the card was open), lined up the papers and the smaller Scallop Circle, and ran it through the die cut machine to create the circle opening. 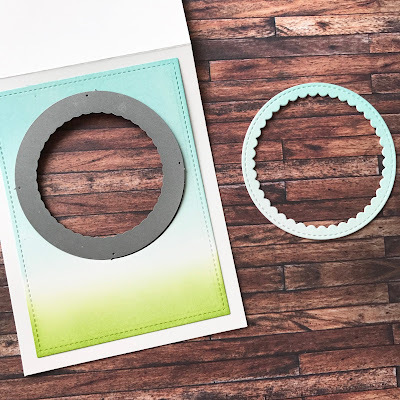 You can choose to leave the circle as is, but I decided to put the scallop frame back onto the card. I turned the panel over, placed the frame and taped all around the sides (see picture below). Then, I added double sided adhesive around the card base. Next, I took the two bears that I previously colored with Copic markers for the The Daily Marker 30 Challenge and wedged a invisible string down the middle (making sure to add strong adhesive) and adhered the bears together. What's great about this image is that it didn't require any mirror stamping. Next, I centered the bear in the middle of the circle of the card base, and adhered the strings to the top and the bottom (making sure the string was taut) and added the front panel on top. To finish the card, I added the sentiment from Friends Forever, and the cloud from Rainy Days Set. To see the bear spin you can visit my IG sharingnewlove. I love making interactive cards like this one. I think they bring a smile to whoever receives them. Thank you for stopping by, and I hope you enjoyed today's post! Hello there! Today I'm sharing a shaker card that I made with amazing products from Pretty Pink Posh. I also stretched two of the critter stamps to give them a tribal makeover. 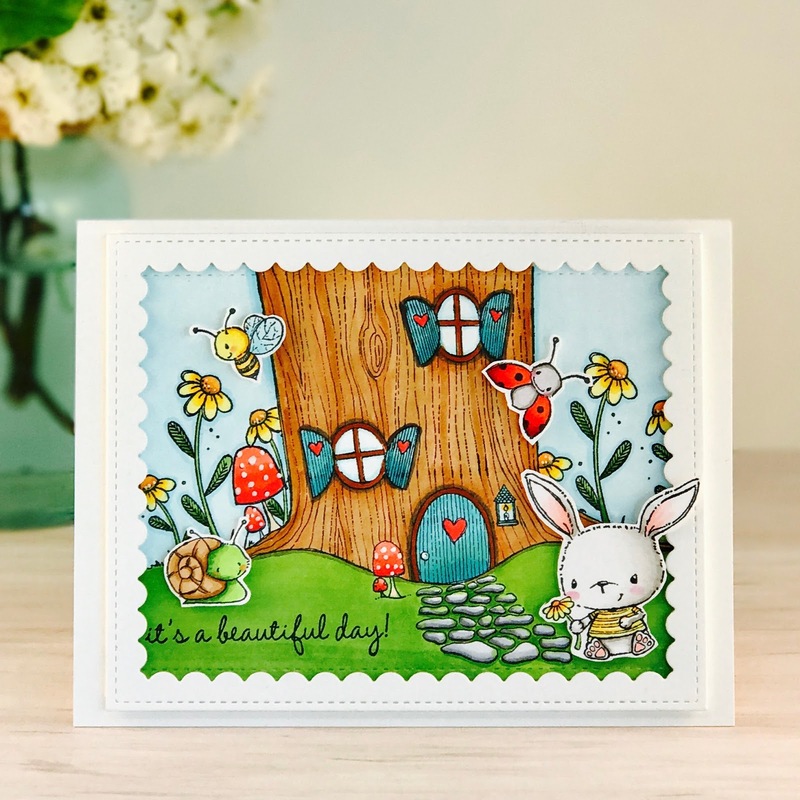 For this card, I combined a variety of stamp sets to create this one of a kind scene. I used my favorite bunny from Holiday Pals, the fox from Fox Friends, and the tent, tree trunk and leaves from Camping Friends. I stamped the images with black ink on smooth white cardstock. 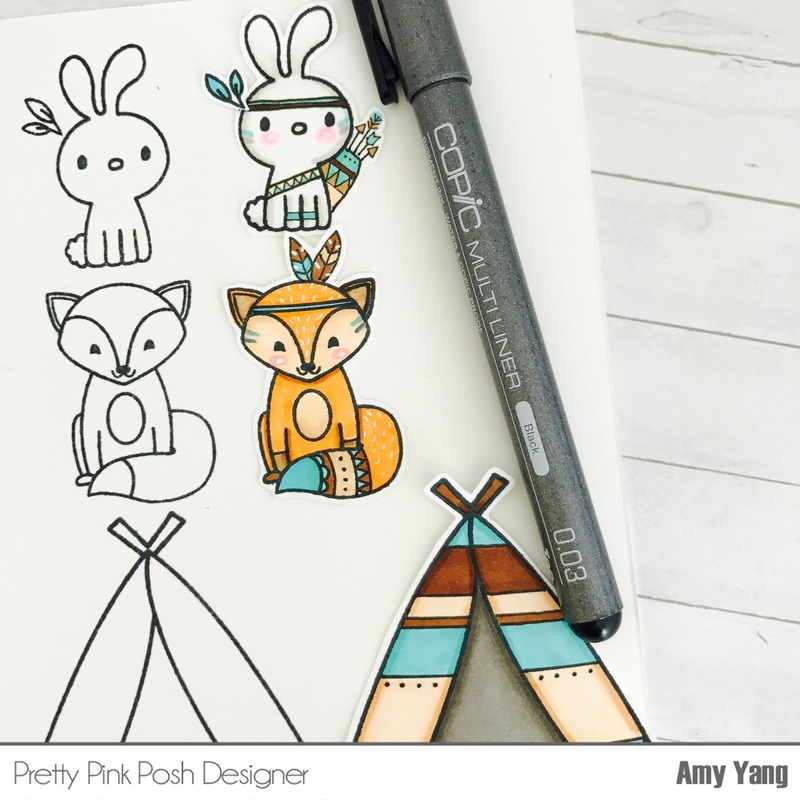 I stretched the bunny, fox and the tent images by giving them a tribal look. To do this, I used my black Copic liner and drew some simple lines and dots. This is very easy to do once you know what you want them to look like. I'm far from being an artist of any kind so if I can do it, anyone can! After, I colored the images with Copic Markers and fussy cut them out. To create the shaker part of the card, I trimmed Bristol paper to 5.5" x 4.25". Using an acetate stencil I made with one of the Stitched Borders 2, I created puffy clouds using Peacock Feathers Distress Ink. Next, I trimmed smooth white cardstock and acetate to 5.5" x 4.25". I die-cut the cardstock using the larger Window Frames die and adhered the acetate behind it. Before adding the foam adhesive around the back of the window, I stamped the sentiment "You Are Amazing" from the Everyday Greetings stamp set. Next, I added Aquamarine and 6mm Ocean Spray sequins and adhered the shaker window to the stenciled clouds paper. I then die-cut green cardstock using Scallop Borders to give the images a ground to sit on. To finish my card, I added the images to the front panel and glued more sequins around the sentiment. I hope you like today's card, and I have inspired you to try stretching your stamps to give them a totally different look. Thanks for stopping by! Hello crafty friends! It's finally starting to feel like spring where I live. It's 70 degrees outside today, and I'm enjoying this beautiful weather. I thought it'd be fitting to share this card that I made couple of weeks ago using Wishing Mouse Dandelion rubber stamps from Purple Onion Designs. I die-cut Bristol paper using Mama Elephant's All Prettied Up- Creative Cuts. Then, I stamped the images using black Versafine ink and covered it with Malotow masking pen. Once it dried, I distressed the background using Tumbled Glass in Distress Ink. I splattered the background with water using my fingers and a paint brush. I picked up some of the colors off the paper using a paper towel (I may have added one too many circles (・∀・)). I removed the masking fluid and colored the images using Zig Real Color Brush Markers. 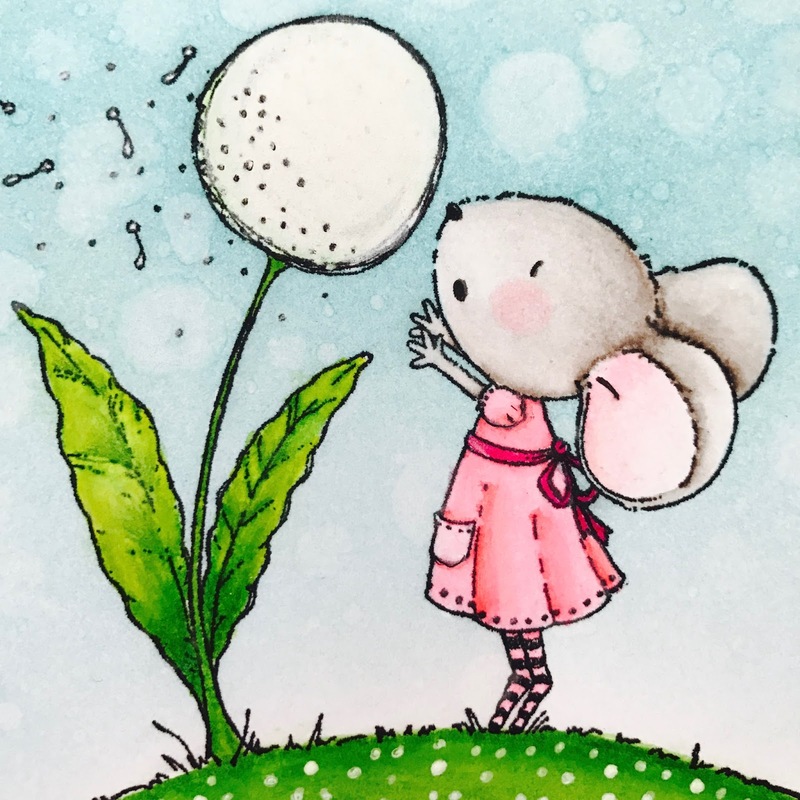 I wanted to add more interest to the ground, so I placed white dots with a white Gelly roll pen and added white Wink of Stella on the dandelion for shine. Lastly, I stamped the sentiment from the Sweet Occasions Sentiment Set. That's it! I love this sweet little scene, and I hope you like it too. Hello everyone, Amy here! 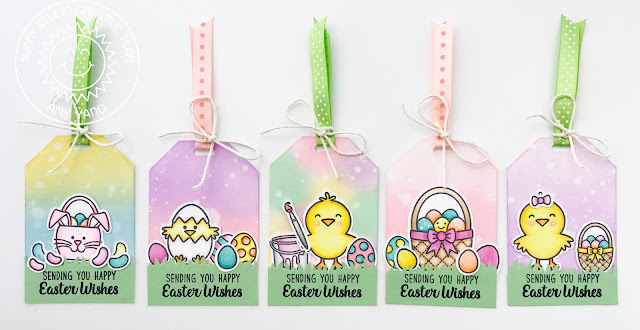 Easter is around the corner, so I made some gift tags to share with you using the adorable A Good Egg stamp set and Traditional Tag Topper dies. 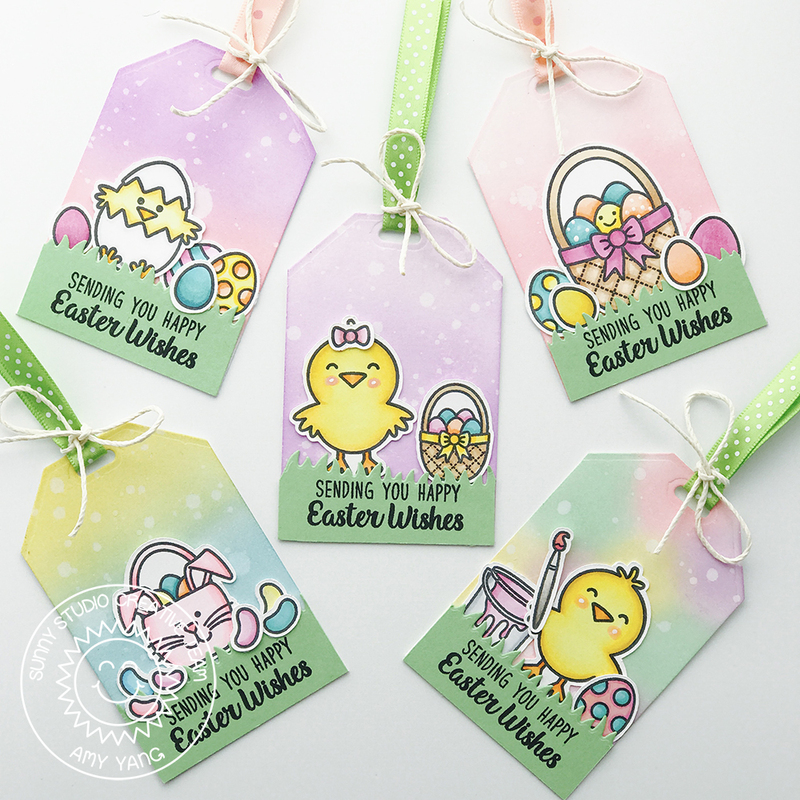 A Good Egg is one of my favorite Easter stamp sets; a must have in my book. I colored the images using Copic markers and cut them out. Next, I trimmed 5 Bristol papers to 3 ½ X 2 ¼ and die-cut the top using the second smallest die that comes in the Traditional Tag Topper set. I also die cut a hole for the ribbon using a die from the same set. I distressed the backgrounds of the tags using Distress Oxide inks. I added splatters of water using my hand for a textured look. Then, I stamped the sentiment from Easter Wishes stamp set on light green cardstock that was die-cut with a grass die. Lastly, I adhered all the images onto the tags and added my ribbons and twine. These tags were super easy and fun to make. I think they will add a lot of cuteness to any Easter gift, don't you think? 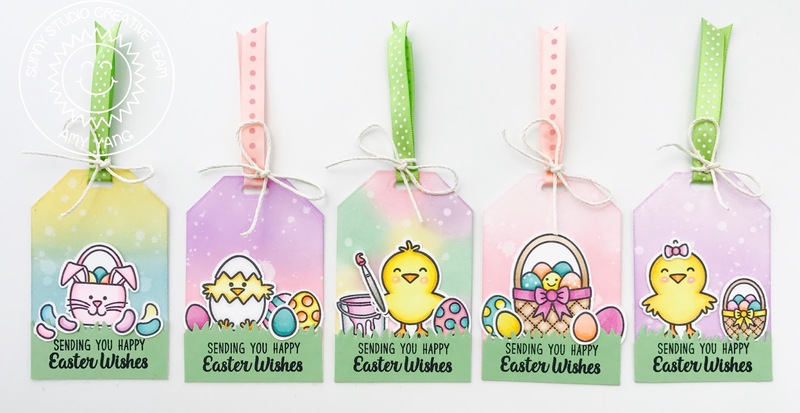 I hope I have inspired you to make some of your own tags using wonderful Sunny Studio Stamps products Thank you for stopping by, and have a wonderful day! Hello friends! Today I'm sharing a watercolored card using rubber stamps designed by Stacey Yacula that is available for purchase at Purple Onion Designs. Stacey's illustrations are always so sweet and beautiful. I love working with these wonderful products. I trimmed watercolor paper slightly larger than A2 size card and stamped the Perfect Spot background using Versafine Ink in vintage sephia. I used Kuretake Gansai Tambi to watercolor the background. What do you think of the pink trees? They were inspired by one of the Stacey's work I saw on instagram. I thought it was so pretty, I had to give it a try. After the paper dried, I die-cut it using a A2 size rectangle die from Peek a frame creative cuts by Mama Elephant. 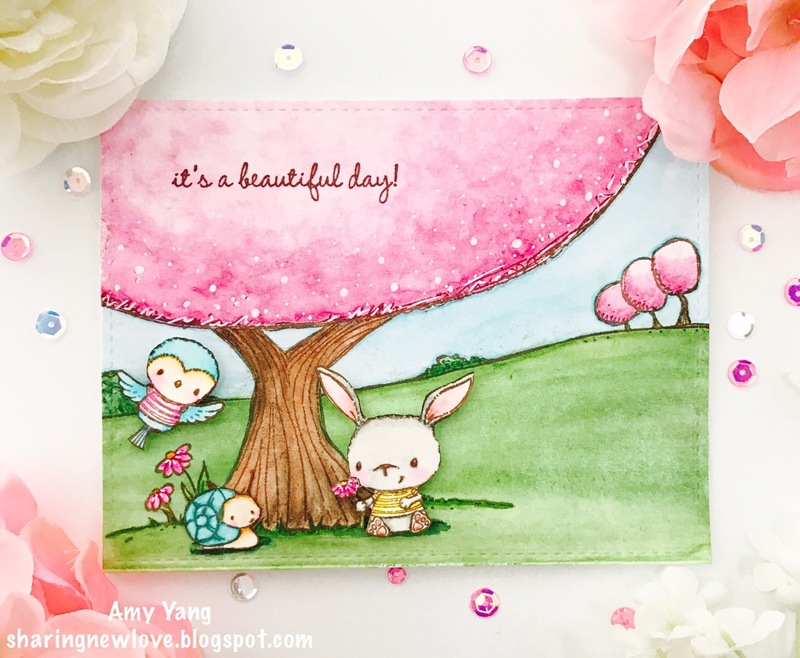 Then I stamped the sentiment "it's a beautiful day" using vintage sephia from the Sweet Summer Sentiment Set. I stamped Chloe Bunny With Flower, the snail from Garden Bugs Set of 3, and Robin striped-t-shirt flying bird using Versafine vinatge sephia on watercolor paper. How cute are these images!!! I colored them using Zig clean color real brush markers and fussy cut them. Lastly, I adhered them to the front panel and used the Gelly roll white pen to add some accents to the tree and flowers. Hello everyone! 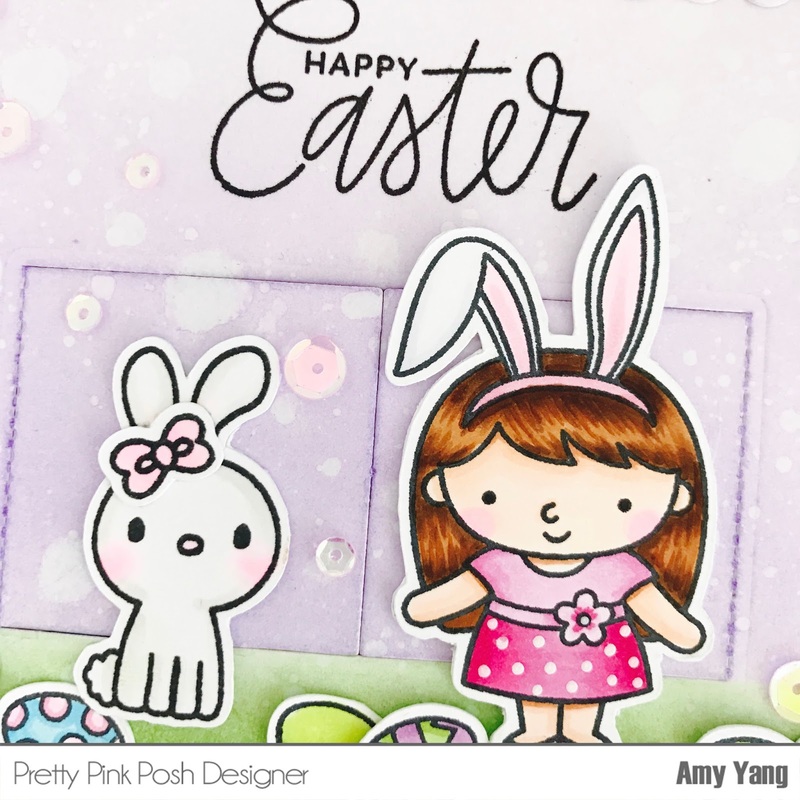 Today I'm here to share with you an Easter card using some of my favorite products from Pretty Pink Posh. To begin, I trimmed two Bristol paper to 4"x 5". I also die-cut Bristol paper using the larger Scallop Frames. I blended Distress inks in mowed lawn and wilted violet to the main panel, the panel inside the Peekaboo Window and the scallop frame. 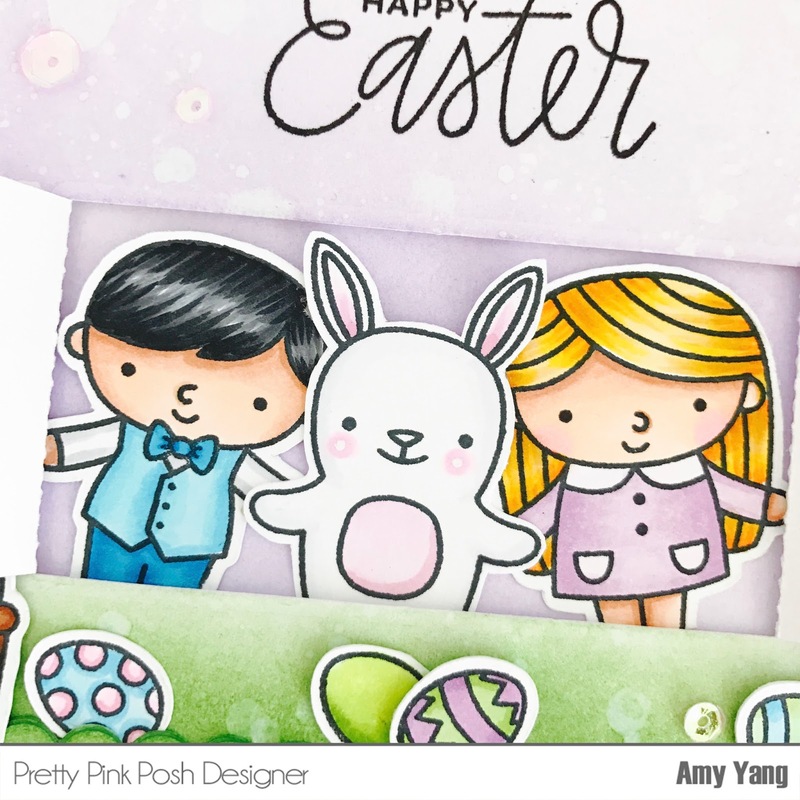 Most of my images are from adorable Easter Friends stamp set, but I also added a girl from Friends Forever, and a bunny from the Holiday Pals stamp sets. I stamped the images on smooth white card stock and colored them in with Copic markers. 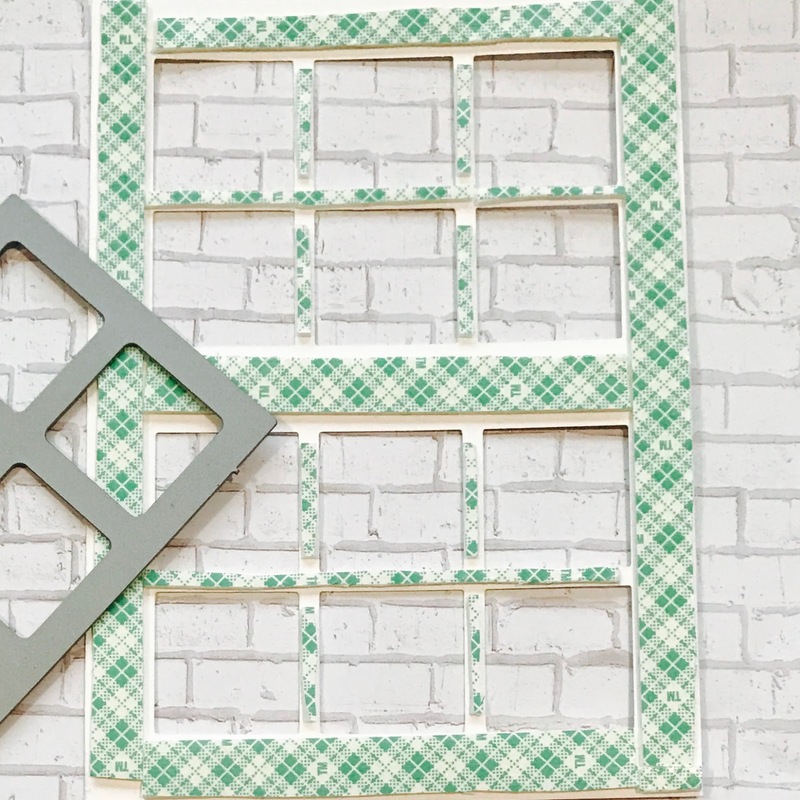 To assemble the card and to create my scene, I started by die cutting the front panel using the rectangle die from the Peekaboo Window set. This is such a great set to own, now I'm able to hide some friends behind the main panel for a fun and surprise element. I adhered the hidden friends to the second panel and added foam adhesive around it (covering the whole panel). Then, I adhered the scallop frame to the main panel along with other images and adhered that on top of the second panel. Lastly, I added the oh so pretty Friendship Mix (a must have) to complete the card. Thanks for stopping by! Have a wonderful week ahead!! !